night two times in 2008. The battlefield is well kept and the local history is extensive. We documented the grounds with still photos before that evening and we carried all the usual equipment. I was filming with a Sony Ir video camera, and followed the team past the museum to the river. Faintly, we could hear the loading of a container vessel across the river, the sound easily mistaken for cannon fire! While filming on the board walk, I sensed a presence behind me and quickened my step to catch up with the others. Before I reached the safety of the team I was surrounded by a deep cold that tingled and caught my breath as it moved through me. The event left me shaken. The boys noted a chill in the air that followed me as I passed behind them, and thought they heard a voice. During our second vigil another team member had a similar experienced. 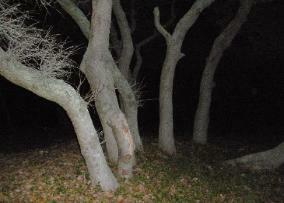 The trees to the south of the main sally port seemed to be inhabited by black shadows, and was witnessed on both night vigils. 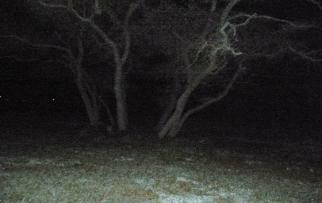 While reviewing our video evidence we noted a white form spinning from the trees and moved over our heads as we filmed. Stills of the video showed only a gray amorphous rotating cloud. The parade ground also proved to be active. Around 3 am Doug thought he saw two of us bent over running from the old barracks area towards Shepard’s battery. As Doug starred, he thought it odd that I would be running, then realised the two figures were dressed in dusty tan tunics and were only visible from the waist up. As he watched, the specters vanished into a soft glowing dusty mist… It was a clear night with a stiff breeze, impossible for fog. Shelia noticed what she thought to be a drunk or injured man in the same area on our second vigil. That apparition was also witnessed by Doug from a different viewpoint before it vanished. EVP evidence was drowned out by the sounds of the ocean and a brisk breeze. 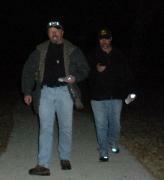 No EMF spikes were noted, and our team was unable to document the shadows or the ghost like apparitions. The video of the fleeting disc shape in the mist will be added from our archives, but this anomaly cannot be considered as evidence of the haunting. 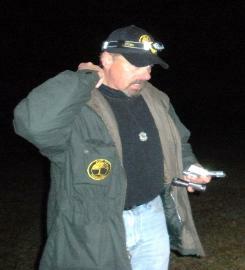 All Team members had personal experiences during one or both investigations and a full body apparition of two men was sighted running across the open filed. Port City had planned to return with more equipment, static Ir cameras and a larger team, but the site is now closed to night investigation. 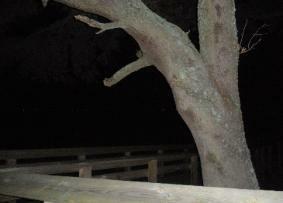 Fort Fisher is a very active site and with ghost sightings reported 24 hours a day! but traffic makes investigating difficult. Fort Fisher was one of the last state owned battlefields in North Carolina that were still open to paranormal researchers. Unfortunately, this historic site is now closed to further after hours investigations due to vandalism caused by amateur ghost hunters, thrill seekers, and artifact hunters posing as legitimate paranormal investigators. 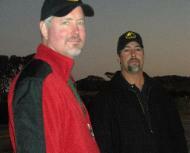 Not all paranormal teams are trained in Parapsychological Field Investigating. Before allowing anyone into your home or on your property, be sure to ask the right questions, and to protect yourself, your family and property. Click to learn how.